If you are looking to improve your outdoor living space, you will be faced with a long list of options. At Suncoast Patios Ltd, we believe that a pergola roof is the best, cost effective way to transform your outdoor living area. 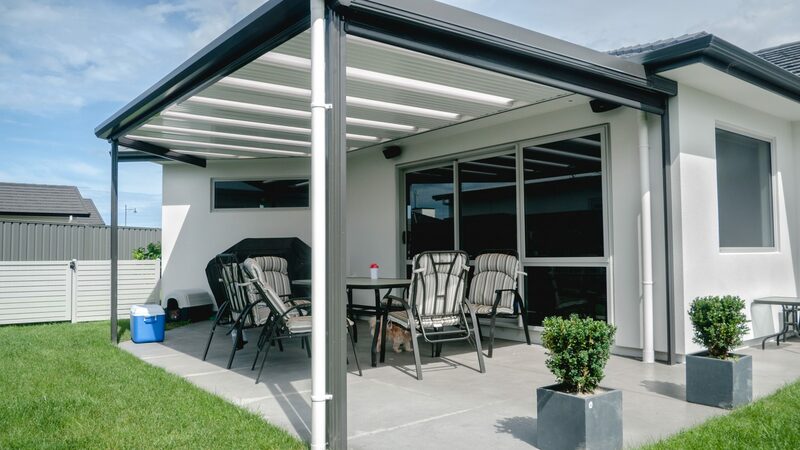 The protection from the elements, stylish aesthetics and build quality designed to stand the test of time are just the basics of why we believe the Stratco Outback® Flat pergola roof is a great option to create an alfresco living space. A pergola might just be the perfect solution. 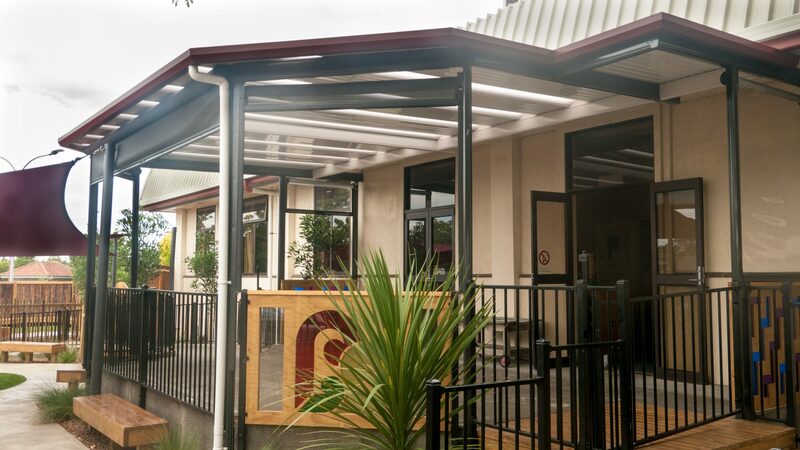 A rather simple structure, a pergola is a combination of sturdy steel beams supported by steel posts with specially designed sheeting and light panels. 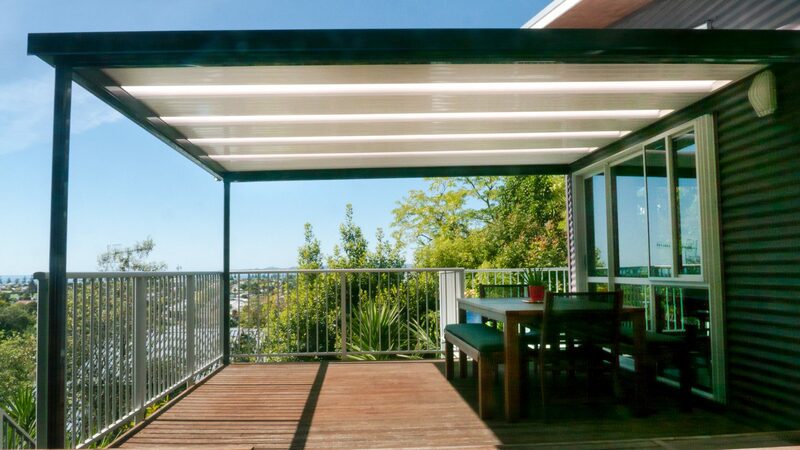 The result is a well lit extension to your original space – when installed as covering for your deck or patio, or the creation of an all new space when installed in a secluded region. An enhanced living space that adds beauty and appeal to your home is an amazing advantage especially with the beautiful climate we enjoy here in Hawke’s Bay. Come rain or shine, your outdoor space will an environment to enjoy. Pergola roofs keep away the scorching burn of the summer sun, while also of course being 100% waterproof to shield you from rain. With this added protection, you will be able to spend even more time outside, enjoying the warmth of a refreshing day without the beat down of the sun, or even just have a place to leave your muddy shoes outside in the winter. The Stratco Outback® Flat roof is perfect for Hawke’s Bay home owners who have come to value the usefulness of an outdoor living space. Its flexible design allows it fit perfectly with just about any home style or theme. Freestanding or as an extension of a building, the Stratco Outback creates a valuable space that can be used to entertain visitors, or just enjoy a sit around with family. We have installed pergolas in hospitals, offices, restaurants, clubs, schools, and personal homes. Whether you choose to have them installed on your deck, backyard, or courtyard, or you would love them as a covering for your parking space in your home, the Stratco Outback pergola roof can be customized to meet your particular needs. Cleanly designed, Stratco Outback® roofs add a touch of style to any outdoor space. Throw in your grills, add in your flower pots, move in some furniture, or keep it simple with a few chairs and a dining table, and you have you a space to be proud of. Considering having an outdoor wedding, party or event in your home? As this trend becomes increasingly common, you may consider be looking into hiring gazebos or some form of shelter. A pergola roof can serve all of these purposes while adding value to your home, eliminating the need to lose money hiring shelter on each individual occasion. If you know your home could benefit from a pergola roof, contact us here. Afterwards, our highly experienced team will meet with you to discuss how a pergola roof could fit in your home. Subsequently, you will be provided with a quote. Once we have your confirmation to go ahead, Stratco will custom make your Outback® flat roof. Once your order is ready, the installation takes roughly 2-5 days depending on the size of the roof. 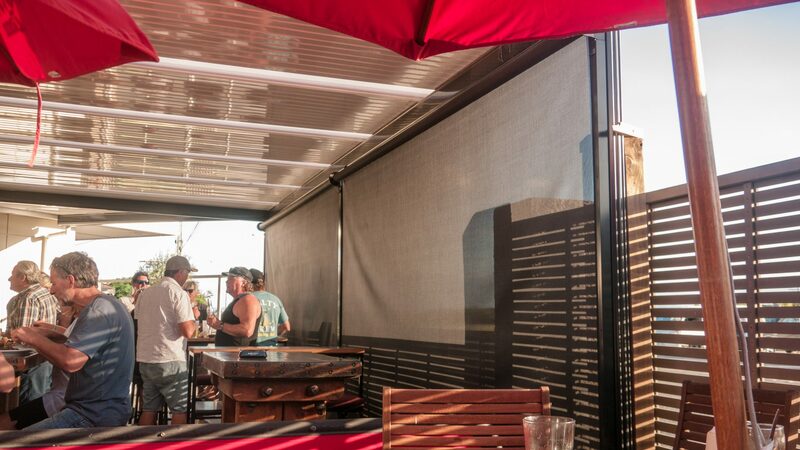 To ensure your space is even more private, and to offer more protection from the elements, custom outdoor blinds that roll up and down can also be installed as part of the package. It’s becoming extremely common for our customers to also have outdoor style rolling blinds installed along with their pergola roof. Blinds are the perfect compliment to a pergola roof, mainly for privacy, wind, and like the case in the image below, sun protection. Almost every pergola roof or louvre roof is now being installed with outdoor blinds since we introduced them. The combination of a pergola roof with the rolling blinds allows a whole new room to be created on your home. Quality and customer satisfaction are our top priorities at Suncoast Patios. This is why we confidently use the Stratco Outback® Flat Roof system. Made from durable, high quality materials, you do not have to worry about rotting, leakage, mold, or rust. 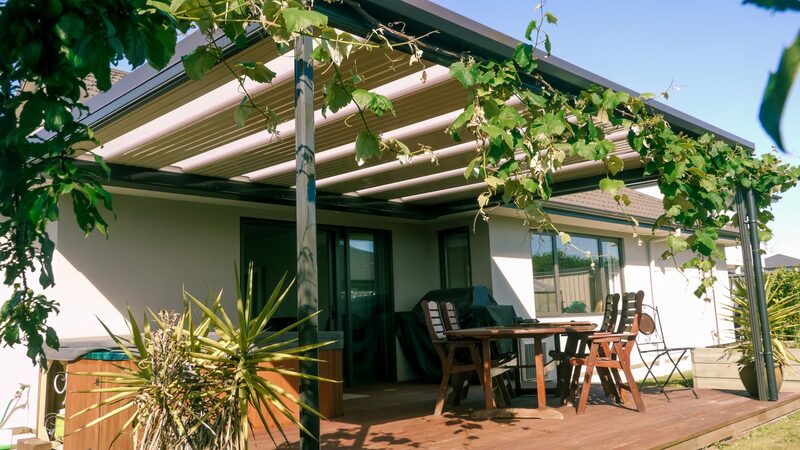 These element-resistant materials take away any worries you might have regarding the long term life of a pergola roof. Easy to maintain, our range of pergola covers can be customized to your needs and can be used for a wide array purposes, every one ensures the following. A multifunctional outdoor covering for your home or business! For more examples of pergola roofs installed by Suncoast Patios Ltd, check out our gallery! If you’re interested in a quote or have more questions, contact us here.